Integrated, real time, market intelligence linked to your therapeutic areas of interest. 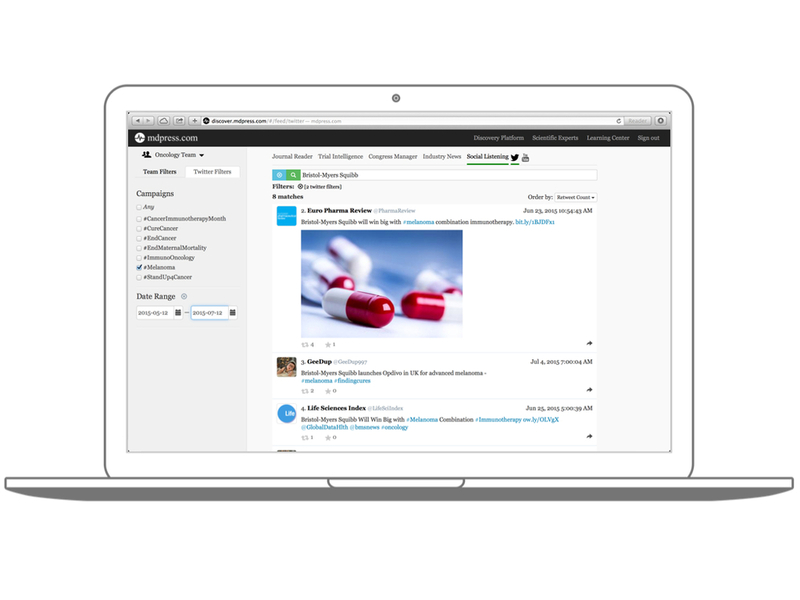 Medical Publications, Clinical Trials, Congress Reports, Industry News, Social Media, and Thought Leader Engagement Seamlessly Integrated into a Single Platform. Follow Journals, Conditions, Treatments, and Companies in your Therapeutic Area. Identify, Profile, Segment, and Follow Experts, Authors, Investigators, Speakers, and Social Media Influencers in your Therapeutic Areas of Interest. By far the most advanced solution in the pharmaceutical industry. Contact us for a Demo. Harnessing the rich data space in pharma to provide actionable insights to clients. The best way to learn about our platform is to see it in action.